For a Weakness Potion, add a fermented spider eye to a water bottle. 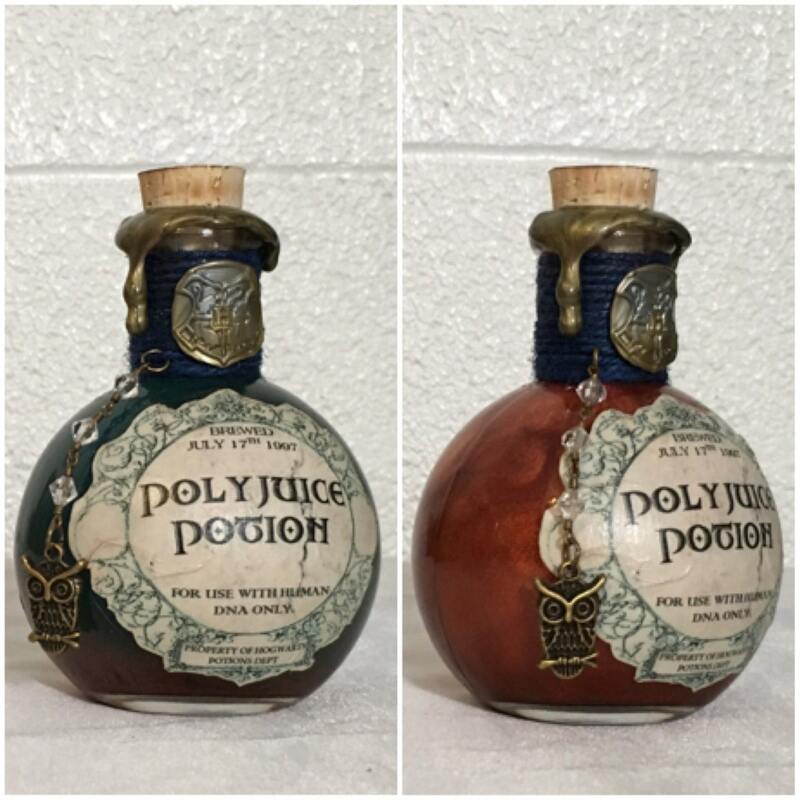 For Harming Potions, add a fermented spider eye to either a Healing Potion or Poison Potion. For a Slowness Potion, add a fermented spider eye to either a Potion of Swiftness or Leaping.... As for the eating trick you are out of luck if you have the shrunken stomach weakness. Listening to music on its own doesn't seem to do the trick. Listening to music on its own doesn't seem to do the trick. I only have fireball, and I forgot to make weakness to magic potions, but fortify destruction alone is often good enough, as it boosts damage by 198%. I only use weakness to poison/fire on strong enemies(so far I only did it on a dragon) and they go down ridiculously fast. Still gonna have to get a proper expert/master fire spell.... Potions of weakness lowers a player's attack power and are made from the brewing stand. Normally this potion lasts about a minutes and a half. 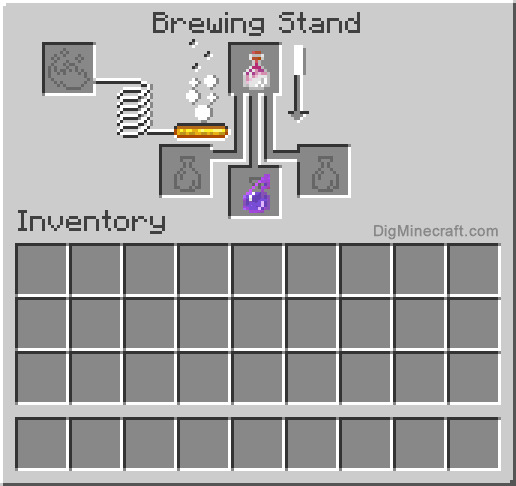 Using redstone dust will make the potion last up to four minutes. Adding redstoneto this potion will increase the amount of time the potion last forand adding glowstone reduces the amount � of time the potion willlast but will increase it to a swiftness 2 potion. Add gunpowder toturn it into a splash potion and dragon breath to turn it into alingering potion.... Ingredient Name Source; Glass Bottle: Crafted from Glass. Nether Wart: Find it in the Nether, farm it on Soul Sand. Blaze Powder: Crafted from Blaze Rods, dropped by Blazes in the Nether. 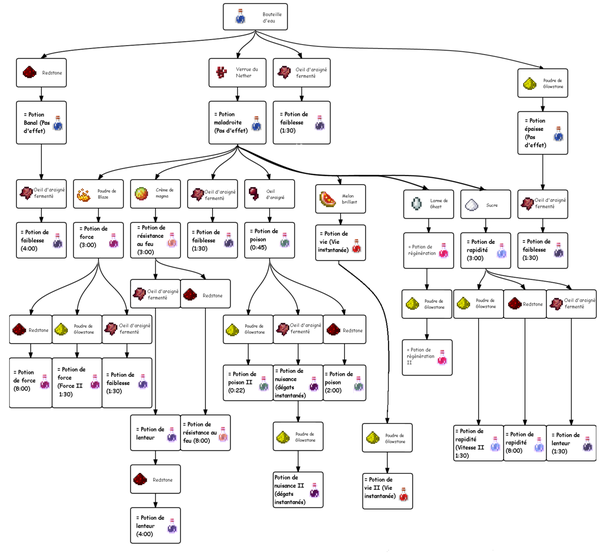 Can be brewed using a Regular Potion of Healing II with a gunpowder in a brewing stand, brewed from a Splash Potion of Healing I using glowstone in a brewing stand, or found in pots_uncommon, pots_rare, dungeon_uncommon and dungeon_rare chests. I only have fireball, and I forgot to make weakness to magic potions, but fortify destruction alone is often good enough, as it boosts damage by 198%. I only use weakness to poison/fire on strong enemies(so far I only did it on a dragon) and they go down ridiculously fast. Still gonna have to get a proper expert/master fire spell. -Potion of Weakness. Crafted by combining the Awkward Potion with a Fermented Spider Eye. Reduces all melee attacks by one heart of damage. Crafted by combining the Awkward Potion with a Fermented Spider Eye.